It feels soooo good to be able to say I crossed off another item on my long WIP list yesterday afternoon! In July, I attended a local arts and crafts gathering at my local airport called “Arts and Parts”. I gave out a few business cards and had a nice time chatting with other local artisans. In August, I received an email from a woman that I had talked with that day, and she asked if I could quilt a quilt top for her in time to gift to her mother just after Thanksgiving. She dropped off the quilt in early September, and she picked up the quilt from me yesterday. And did I mention that many of the fabrics had a lovely golden sparkle in them? Yum! It was a lot of fun to quilt. 🙂 The quilt top was 77 inches wide by 100 inches long, and I am a bit sad to say I neglected to measure its size when I was done with the quilting (you know I love that information!). I used Quilter’s Dream Dream Green batting. When I was ready to start quilting, the first thing I checked was how the quilt top sized up in relation to the backing. It’s not that I did not trust my client, but knowing that there was plenty of width and the spacing top to bottom was slightly tighter helped me know how to load it on my longarm. 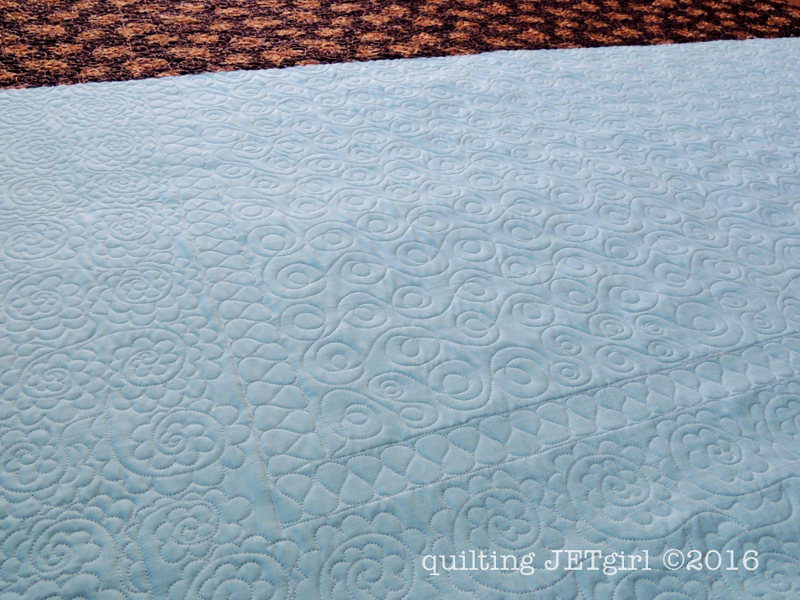 I just love getting to see the quilting detail on a nearly solid backing like this, too! I quilted using 50wt Aurifil #2000 (Light Sand). We discussed different motifs and settled on a double loop in the center bargello center, ribbon candy in the first border, and a large floral design in the outer border. It is fun to see how quilting can transform a quilt top! I received an email from my client as soon as she returned home saying that she is amazed with the quilting, and she asked if I would consider quilting her first pieced quilt top for her. I am so glad she liked working with me so much and I look forward to the next project for her! Wow, beautiful job! And you picked very nice designs with your customer! Very nice quilting, the pattern is perfect, I bet both your customer and her mother will be very happy with the quilt! 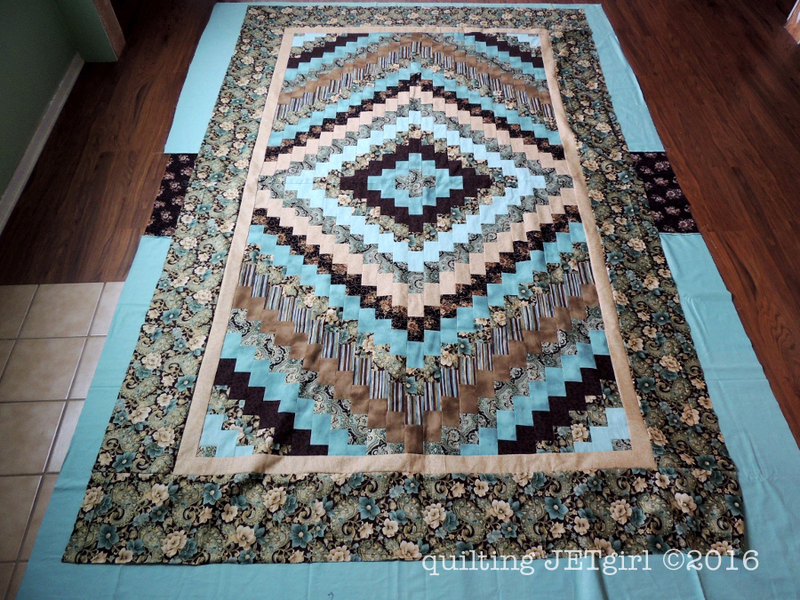 Yvonne, the quilting is beautiful–I love the designs! I also heard that you did the October Bee Buddy interview for Vanessa Wilson–can’t wait to listen to it! Your quilting is lovely, and a repeat customer shows how much she loves it. You did a spectacular job, no wonder she wants you to do more! So will all her friends. Having a happy client makes it so worth it! The quilting is wonderful and brings the quilt to a whole other level! You did a lovely job, so not surprising your client was pleased. Beautiful job with the quilting! The best compliment is return business–congratulations!–well deserved! Beautiful job well done . And congratulations on your first custom quilting order and a repeat customer already ! Congrats Yvonne–may you have many more customers knocking on your door! Good job! Congrats on expanding and having satisfied customer! What a fantastic job you did and so great to hear wonderful feedback from your customer! This turned out beautiful, Yvonne. I do love a ribbon candy border, it’s such a fun design to quilt. Congrats on a very happy customer! it looks like the start of a great quilting relationship. That’s so nice! Great quilting and a happy customer: can’t ask for more! Congrats! 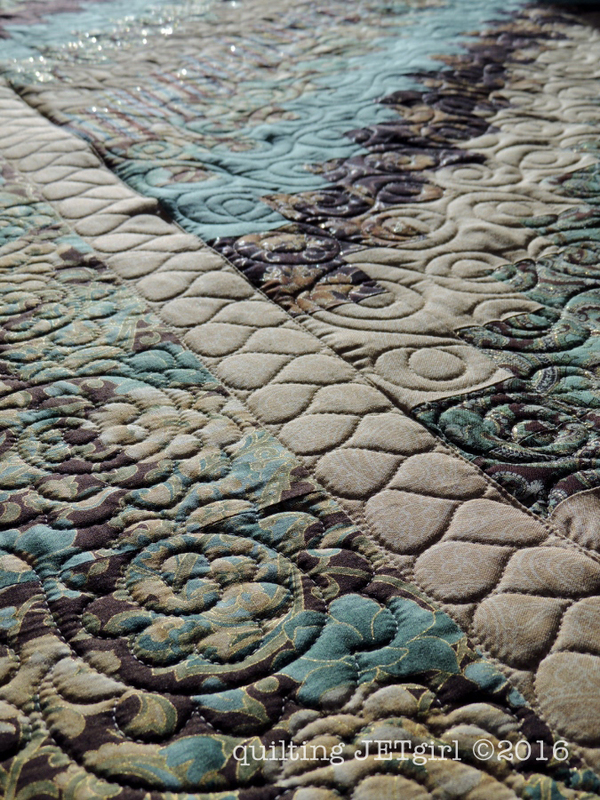 Congratulations on this beautiful quilting finish. How wonderful that she loved your job and wants you to do another. I love your border quilting and now want to go sketch it out. Thanks once again for the inspiration. The quilting is awesome. And the quilt is beautiful. Glad you have a happy customer. You did a fantastic job, Yvonne! And I agree, seeing all the lovely quilting on a solid back is always fun. Congrats on your first client quilt. It’s definitely a success.